UK France Bikers.com reports that yesterday’s – 18th June 2011 – French riders protests organised by the FFMC – the Fédération Française des Motards en Colère (The French Federation of Angry Bikers) against their governments plans to introduce a raft of “ridiculous” road safety policies and law enforcement legislation attracted approximately 100,000 riders across France and some of its overseas territories. These included the island of Reunion (located off Madagascar and Mauritius) with almost 2,000 bikers, the islands of Martinique and Guadeloupe in the Caribbean and also some bikers gathered on the island of New Caledonia (located off Australia and New Zealand). The UK France Bikers.com goes on to report that, “Each town and city was brought to a complete standstill for hours with the local population being totally unable to move around. 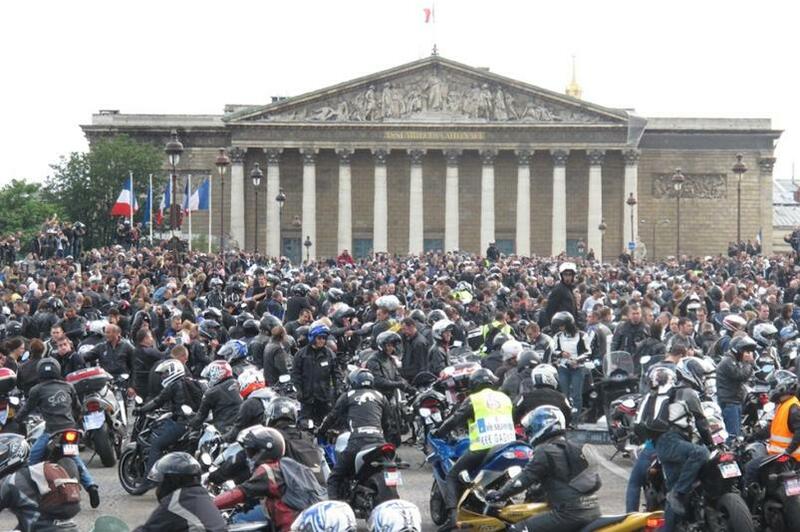 Paris alone saw more than 15,000 bikers blocking the heart of the capital, Lyon (France’s second largest city) saw more than 10,000 bikers, Lille (in the north of the country) counted more than 7,000 angry motorcyclists, Toulouse (in the south-west) was totally blocked by 8,000 bikers, Marseille and Bordeaux (in the south-east and south-west respectively) were also paralysed by 3,000 bikers each. 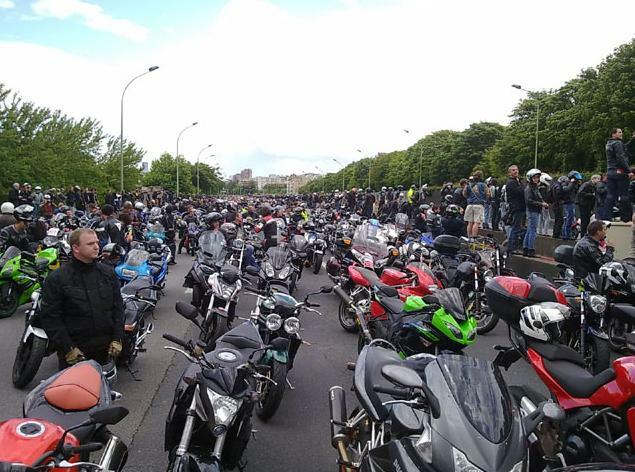 Thousands of bikers blocked central France with 3,500 of them in Clermont-Ferrand, the whole of Brittany (in the north-west) with more than 3,000 bikers in Brest, Quimper and Rennes. The east of the country was also brought to a standstill with more than 6,000 bikers protesting in Strasbourg, Mulhouse Reims and Metz. All electronic devices, even smart phones and GPS systems, will be banned if they are able to warn of radar speed checks. Sanctions are draconian and might go up to 30.000 Euros or 2 years prison for the sale of such devices, while its usage will be punished by a fine of 1.500 Euros plus the loss of 6 points of the French traffic account system. 4 million speed detection devices have been sold in France over the last few years. The removal of speed trap warning signs. Immediate jail terms for those caught doing more than 30mph (50kph) over the speed limit. FFMC has invited the Government to review its road safety policy and take into account the real causes of road accidents. 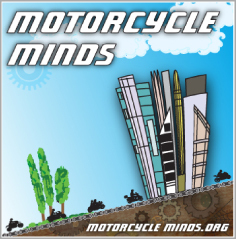 Measure 11: Improving the visibility of motorcyclists. · Obligation to wear a retro-reflective equipment for motorcyclists or tricycle over 125 cm3. The safety of users of bike is an essential part of reducing the accident rate in urban areas or out of town. It requires a more visibility to be facilitated, in case of failure but also circulation. In addition, users of motorized two-wheelers are not protected by a body. In case of fall, even at low speeds, the slightest shock can be fatal or cause serious injury. Many users neglect the wearing of personal protective equipment. The first equipment protection is clothing of the user. Also on the Governmental website http://www.gouvernement.fr/presse/comite-interministeriel-de-la-securite-routiere&usg=ALkJrhg1t4jQ768ZWZN7JtyYSf85gg1Q8Q the press release from the 11th May says (again using google translator) – Drivers of motorcycles and scooters should wear retro-reflective device. However whether a jacket, a vest, an armband or reflective strips on clothing, complusion is not the answer! They did not ‘propose’ and there were no scaremongering at all. The french governement “stepped back”, talking about misundertanding and that it was all about an arm strap … etc. Not talking about arm strap, but about hi viz cloth jacket. Well, well, well – the truth comes out. Not legislation to wear Hi Viz jackets in France – nothing of the sort! 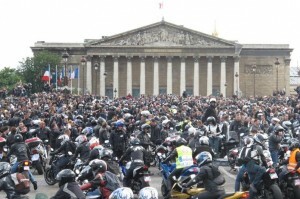 Further to the bikers’ demonstrations that took place last Saturday throughout France and paralysed the entire nation (read below), Michèle Merli, in charge of France’s road safety and working closely with Claude Guéant – current French interior minister, has made herself heard on national radio. According to Ms Merli, it would appear that the bikers have totally misunderstood the proposed obligation for all to wear a fluorescent high visibility yellow vest! Ms Merli has said that it has never been a question of wearing that vest but rather propose (not impose?!) to the bikers that they wear a little yellow strap around their arm so that they can be better seen by motorists. So what does that mean? It means simply that the campaign against compulsory day glo/hi viz is just scaremongering – and may I suggest simply for FFMC, MAG UK etc to get more members and FEMA to cover up its incompetence. Also the scaremongering about the Irish having compulsory day glo/Hi Viz is not true – it was a proposal in a consulation, that has gone nowhere! This is outrageous when there are more important issues to be aware of – not least the EU Commission’s proposal on market surveillance that will be voted on in the Internal Market and Consumer Protection Committee next week. The problem here is that it requires too much attention to detail and admitting that they (FEMA and its National Organisations) backed the wrong horse – in this case Wim van de Camp who instead of being the biker’s hero, turned out to be a Trojan horse – by not only agreeing with compulsory ABS, AHO and on board diagnostics for bikes over 125cc, but also wants tough anti-tampering measures for a problem that doesn’t exist. Regarding complusory Day Glo could this come to Northern Ireland? Irelands Road Safety Authority (RSA) has proposed to introduce regulations for the mandatory wearing of sleeved high visibility upper body clothing for rider and pillion passenger. We will work with and support GB to take forward research to improve motorcycle safety, including conspicuity, and support the European powered two wheeler integrated safety programme. We will take forward appropriate action measures arising from this work. We will consider measures to improve the visibility and conspicuity of motorcyclists. 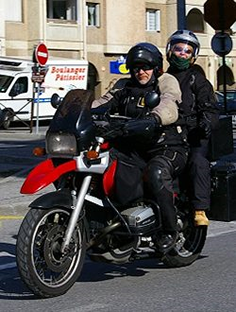 An excellent account of the protest from Mike Werner at Bikes in the Fast Lane “Anatomy Of A French Motorcycle Protest Ride”. He tells us of the demo in Rouen – with lots of pictures and humour.